Rumors that a big tech player is ponying up funds for a Salesforce.com acquisition give the financial media a lot to talk about. 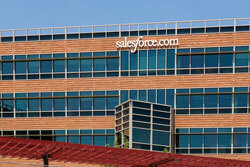 And yesterday Salesforce.com Inc. (NYSE: CRM) stock was up 12% on the rumors. So, who will buy Salesforce? Right now the Wall Street media circus is in full swing trying to find an answer. The problem with this kind of speculation is that it's lazy. And the real discussions about the industry that should be taking place are lost in a flashy but substance-less argument over who stands to gain by buying Salesforce. We'll save you the time. Everybody in the tech world who wants a bigger footprint in cloud should be clamoring to buy this company. Who wouldn't want to buy Salesforce? Oracle: Salesforce CEO Marc Benioff is an Oracle alum and a great friend to Larry Ellison. Microsoft: Hasn't CEO Satya Nadella been pushing hard on cloud since he stepped in as CEO last year? International Business Machines Corp. (NYSE: IBM): This is a natural fit for a company with a large rolodex of Fortune 100 clients and a pressing need to make a splash in the enterprise cloud scene. If CEO Benioff could be bought off, he would have been by now. It's been 15 years since Benioff started revolutionizing the customer relationship management (CRM) business and making Salesforce the first billion dollar cloud company. But Benioff is a different kind of entrepreneur. He's a corporate do-gooder with a knee-jerk aversion to the 9-to-5 lifestyle. He cut his teeth in the laid-back offices of Apple Inc. (Nasdaq: AAPL) in his younger days. And he left Oracle to start Salesforce out of fear of becoming a "corporate lifer." He's not going to so easily watch his empire – built on "gonzo marketing" with a mandate to bring an "end to software" – be swallowed up by an industry Goliath. It runs counter to everything he's built Salesforce on. So, the financial media can have fun speculating on which giant may consider, just maybe, buying Salesforce.